Since I can’t afford a personal assistant to follow me around and spout off what I’m supposed to be doing every minute of the day, I’ve come to rely on Google Calendar for that task (Google Calendar being built into all TOAST.net email and Google Apps accounts). It’s a reliable companion that never lets me down. My schedule follows me with email notifications, synchronizes itself to my phone, displays on my website, and I can even send it a text message if I feel lonely. 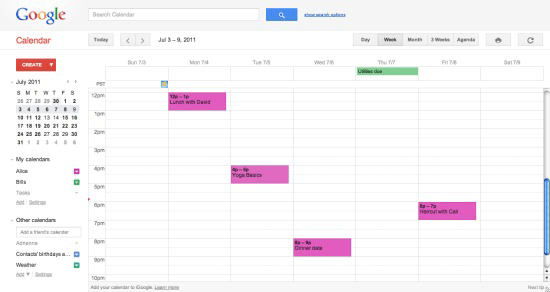 Google is now implementing a few improvements to Calendar, making the interface better looking and easier to navigate. This is part of an ongoing effort by Google to overhaul and modernize their various platforms over the next few months. Click the down arrows to the right of My calendars and Other calendars to access settings, create or add calendars, browse interesting calendars, and more. Events that occurred in the past are now dimmed on your calendar. You can change this behavior on the General tab of Calendar settings. Hover over an event to view the associated icons (indicating reminders, private events, and more). Click the new Print and Refresh buttons at the top right of your calendar. These buttons now have icon labels instead of text. These are the first of a series of updates coming in the next several months. Calendar is one of the most powerful tools in Google Apps, so I’m glad it’s getting some attention. If you have any questions or comments about the changes, ask away! Thanks Doug. The illustrations are very helpful.